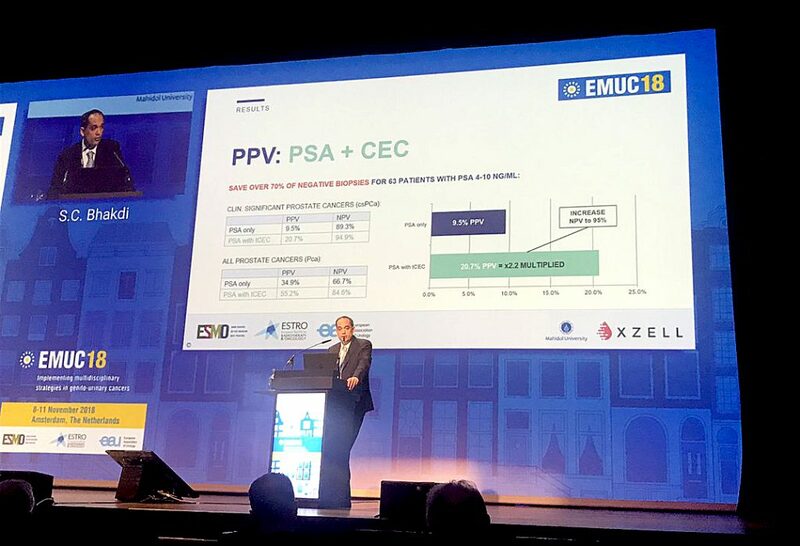 Amsterdam, November 2018 – X-ZELL CEO, Dr Sebastian Bhakdi, has used the 2018 European Multidisciplinary Congress on Urological Cancers (EMUC18) in Amsterdam as a platform to present new insights into the origin and clinical utility of Circulating Endothelial Cells (CEC). Shed from the blood vessels of earliest-stage tumours, CEC are powerful, yet extremely hard-to-locate cancer markers that have long been branded ‘too difficult to detect’ to be considered for routine application. In collaboration with Mahidol University in Bangkok, Dr Bhakdi and the team at X-ZELL have now found a way a way to isolate and visualize the elusive cells in a routine laboratory – in turn allowing them to develop a highly accurate blood test for early prostate cancer detection. First revealed at the 2018 Asia-Pacific Prostate Cancer Conference (APCC) in Australia in August, the so-called ‘liquid biopsy’ has already been subject to extensive testing in Thailand, where it proved to be able to avoid seven in ten unnecessary biopsies for men with equivocal PSA readings. In Amsterdam, Dr Bhakdi not only reconfirmed these impressive interim results, but also shed new light on CEC’s ability to distinguish between aggressive and dormant cancers. “As a relatively young team of researchers, we are exceptionally grateful for the opportunity to have been able to share our work with such a distinguished audience on the main stage at Europe’s most important urological cancer event,” he commented. According to Dr Bhakdi, the feedback he received at EMUC18 encouraged him and his team to launch a series of new research projects in Europe and Asia to fast-track the development of additional CEC-based applications. Dr Bhakdi’s full EMUC speech – including all relevant scientific references – is now available via the X-ZELL blog.